Rubber Spoonula Great for Mud's, Scrubs and Cremes! 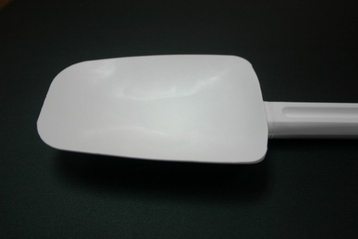 This White Rubber Spoonula is very heavy duty. It 13" long and 3" wide at the head with a strong, thick handle. Makes scooping and mixing your muds, scrubs and cremes much easier! The tip is made of a slightly harder rubber and has some flexibility to it while the handle is a sturdy hard plastic so you can dip into very thick cremes and mud's. Use it to mix your essential oils into your treatment also. The Rubber Spoonula washes clean so your cremes or mud won't get contaminated.